With Zack Mahoney pressed into the starting quarterback role after Eric Dungey was unable to play, the consensus seemed to be simply slim hopes that Syracuse would not get beaten too badly by #8 LSU and their star running back Leonard Fournette. While Fournette had a monster game (26 carries for 244 yards and two scores), both Mahoney and the Orange acquitted themselves nicely. The sophomore walk-on threw three touchdown passes in the second half, but it wasn’t enough as the Tigers (3-0) handed SU their first loss of the season, 34-24, at the Carrier Dome. The Bayou Bengals certainly helped Syracuse by committing 14 penalties totaling 120 yards, but the Orange were game throughout, permitting the visitors to convert only 3-of-10 third downs. SU also kept the Tigers, who were favored by 24 points, within two possessions until the final five minutes of the game and even forced the guests to cover an onside kick with under two minutes to go to keep things from getting even more interesting. It was a bumpy start for the Orange, as their first two drives were three-and-out, but punter Riley Dixon pinned LSU inside their own ten for their first two drives. The Tigers were able to score on their second possession, in large part due to a heads-up play by Leonard Fournette, who returned to the backfield to get a pitch while his quarterback was being sacked, turning a loss into a 48-yard gain. 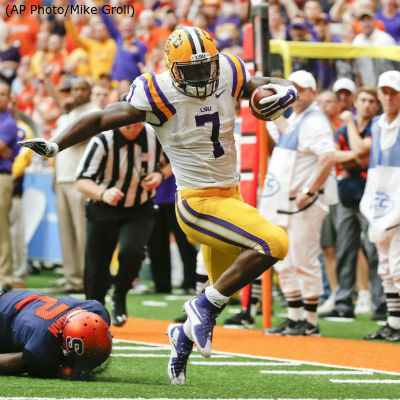 Two plays later, Fournette scored and LSU led, 7-0. The SU offense filed another pair of three-and-outs, but their defensive mates were up to the challenge, forcing the Bayou Bengals to the same fate. Ron Thompson snuffed out the second drive with a sack and forced fumble, but LSU recovered at their own 27 and punted instead of turning it over. Brisly Estime returned that punt 16 yards to the Syracuse 40. The Orange then got their first two first downs of the game, the second coming when Jordan Fredericks converted a fourth-and-one on a direct snap that gained ten yards. A handful of plays later, Cole Murphy came on and booted a 43-yard field goal to make it a 7-3 game just past the midpoint of the second quarter. 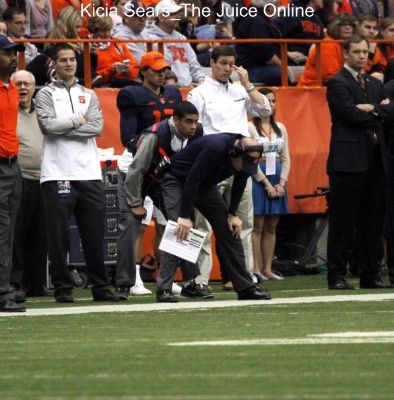 » Related: Is Syracuse’s quick start a mirage? The Orange defense forced another punt, setting up the offense at their own 26 with 4:16 left in the half. The Syracuse offense filed their best drive to that point, getting three consecutive first downs to get into field goal territory. SU lined up for a 46-yard field goal on 4th-and-4, but opted to fake it with Dixon running for five yards to move the chains and give the home fans a jolt of energy. The Orange moved to the 13, but Murphy’s 31-yard field goal try from the right hash hit the upright and fell harmlessly to the ground on the half’s final play. The Tigers took the opening kickoff of the second half and marched for a short field goal to stretch their lead to 10-3. The SU offense failed to gain a first down and punted, only Riley Dixon outkicked his coverage with a 54-yard blast. LSU returned it for a touchdown and a 17-3 lead just before the midpoint of the third quarter. Syracuse started the ensuing possession from their own 33 and struck quickly, using a personal foul and a 12-yard run to get to the LSU 40. Zach Mahoney executed a play-fake that got the Tiger defense to bite, then dropped a beautiful pass into the arms of Brisly Estime, who got behind the defense for a 40-yard touchdown catch. Murphy connected on the extra point to make it 17-10 in favor of LSU. Fournette equaled that score, carrying on all four plays of LSU’s next possession for a total of 75 yards, including a 62-yard touchdown burst. The extra point reinstated the 14-point Tiger lead at 24-10 with just over four minutes left in the third. After each team punted, the Orange took possession early in the fourth quarter at their own 44. The Bayou Bengals helped the SU drive get started with a pair of 15-yard penalties and Syracuse eventually finished it when Mahoney zipped a two-yard scoring pass to Ben Lewis. Murphy’s conversion halved the LSU lead to 24-17 with over a dozen minutes on the clock. The visitors needed less than three minutes to post another touchdown, this one pushing their lead to 31-17 with just over nine minutes on the clock. The LSU defense forced the first turnover of the day on the third play of Syracuse’s next possession, getting an interception at the Orange 26. The Tiger offense cashed in the turnover for a 31-yard field goal and a 34-17 lead with just over five minutes left in the game. SU responded with their longest drive of the day, going 75 yards in 15 plays, and capping the possession when Mahoney found Dontae Strickland with a swing pass for a five-yard touchdown. Murphy’s conversion drew the Orange within 34-24 with 1:53 showing on the clock. Syracuse tried an onside kick, but LSU covered it up. One first down later, the visitors were downing out the clock and taking their victory back to Baton Rouge. While it certainly was not the prettiest game, Zack Mahoney acquitted himself pretty well, completing 16-of-38 passes for 154 yards and three scores, all in the second half. Mahoney also carried the ball six times for a team-leading 40 yards. Antwan Cordy paced a swarming SU defense with eight tackles, including a pair for loss, one of which was a sack. Ron Thompson added another sack, giving him four on the year, and a forced fumble. 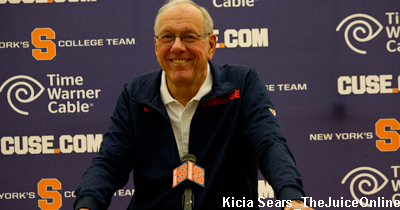 Syracuse now gets their bye week, meaning they have two weeks until their next game. With the extra time off, the Orange hope to have quarterback Eric Dungey and H-back Erv Phillips healthy when they return to action. SU (3-1) returns to action with their first road trip of the season when they head to Tampa to face former Big East foe South Florida on Saturday, October 10. The Bulls, who now call the American Athletic Conference home, are 1-2 on the season and host Memphis this Friday before the Orange pay them a visit eight days later. Game time and television coverage of the SU-USF matchup have not been set at this time.